In the fall of 2018, Mr. Manuel Comeron, an alumnus of the 2017 Meridian International Visitors Leadership Program (IVLP) entitled “Strong Cities: Building Community Resilience to Radicalization and Violent Extremism,” was a programming partner for the Community Connections program. This iteration of Community Connections is a two-part international exchange program between Nashville and Chattanooga, Tennessee and Liège and Verviers, Belgium during which rising American and Belgian leaders in violence prevention exchange best practices in countering violent extremism. In the first part of the program, Mr. Comeron organized a one-week program in Liège for 8 American NGO leaders, government officials, academics, and police officers to meet with their Belgian counterparts. In the second part of the program, Mr. Comeron will identify up to 10 Belgian rising leaders from Liège and Verviers to travel to Tennessee to continue the exchange in the spring of 2019. Community Connections, a program funded by the U.S. Embassy in Brussels, is facilitated by the GlobalConnect Division at Meridian. The following is an interview conducted with Mr. Comeron, who currently works on Prevention Planning at the Office of Urban Security and Safety Analysis for the City of Liège. The interview was conducted in December 2018 by the Meridian Marketing and Communications Intern Liye Hong. Please tell me a little bit about yourself – where are you from, what do you do? I was born in Liège, Belgium and I grew up in Seraing, a working-class city in the metropolitan [suburbs] of Liège. My parents are from Asturias in Spain. I studied social psychology at the University of Liège. After my graduation I worked in the criminology department at the University of Liège and had an experience in the Home Office’s Prevention Policy Unit. Then, I worked for the City of Liège in the prevention and safety department as the manager of prevention of violence in sports. In Europe and Belgium, we have serious problems with hooligans, especially in soccer games. I also spent some years in Germany, involved in programs on youth empowerment through sports for the City of Berlin, and doing studies about security management in the University of Technology. Since 2014, I am in charge of Prevention of Violence and Extremism (PVE) for the local government of Liège. What was the topic of your IVLP and where did you travel to? The topic was about prevention of violent extremism and social work. The program was called “Building Community Resilience to Radicalization and Violent Extremism” and linked with the Strong Cities Network. I traveled to Washington, DC, Chattanooga, Los Angeles, and San Diego, also shortly to Rockville and Anaheim. What aspect of your IVLP experience left the strongest impression? What did you find most useful? My opinion is that all meetings and visits are very interesting and useful. It is difficult to pick which one left the strongest impression. I found the meeting and the visit with the police department in Los Angeles (LAPD), in their psychological unit and the counter-terrorism unit, were highly interesting to me. Besides a high-level conference at a university (University of Southern California), what attracts me the most in LA was the modern vision and integrated approach of the mayor’s office, and, in the field, the social project with an NGO that is trying to work with street gangs: “Homeboy Industries.” In Chattanooga, I was impressed by the inclusive approach of the mayor and the work of the city towards communities, also involving the private sector. Another very interesting project in Chattanooga was a project about youth empowerment through sports. I appreciated the cooperation between the University of San Diego and the City of San Diego facing social and security problems. In Washington, DC, the meeting with the Department of Homeland Security was valuable because of the global approach to the issues and the idea to connect relevant partners. The seminar in Meridian about conflict management with experts on peacebuilding is also particularly useful to me. How did your IVLP experience impact your work once you returned to Belgium? All the interactions with U.S. colleagues are very useful – for sure the knowledge coming from high level and experienced professionals – but I think the holistic approach and the systemic oriented vision to solve the problems is especially useful to me. Another new thing I learned from this is to build connections with the private sector, such as the business sector, to deal with social problems and security issues in our cities. It is not so usual in Europe and in Belgium, because the public sector and NGOs are in charge of the special problems with a weak involvement from the business sector. In addition, the relationships and social links into the IVLP group is another important part I got from the program. The IVLP group included professionals in urban prevention, social work, police officers, politicians and academics from 17 countries around the world, including the staff from USA: Austria, Belgium, Bosnia, England, Honduras, India, Indonesia, Italy, Lebanon, Macedonia, Malaysia, Netherlands, Singapore, Switzerland, Turkey, and Trinidad! I learned a lot from them thanks to a lot of conversations during the travels and the (rare) free time. The IVLP program gathered those people together, and we became close friends after the program. 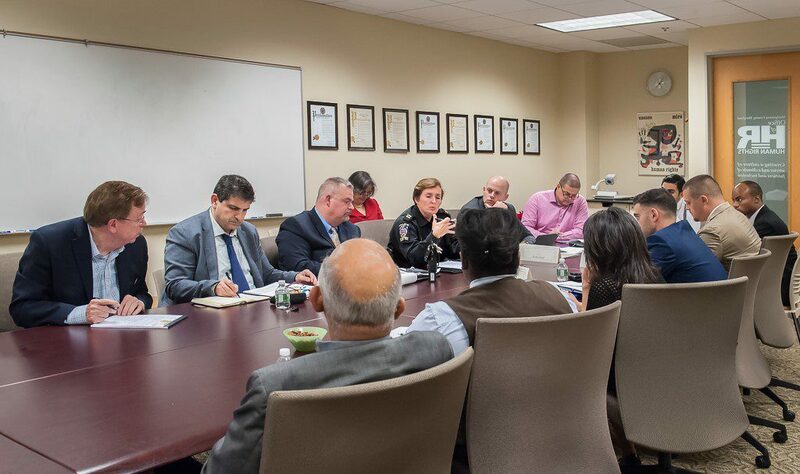 The IVLP group enables us to know more about our colleagues at an international level, to share our experiences and to create strong connections. I understand that you are now working with Meridian to implement the Connecting Communities program between Chattanooga and Nashville, Tennessee and Liège, Belgium. Can you tell me more about the program in general and the program you organized for the American delegation that traveled to Liège? We organized in cooperation with the U.S. Embassy in Belgium a one-week program here in Liège hosting 10 colleagues from the U.S. During the program, we held 12 field visits and meetings, and we reached out to 28 professionals who work in NGOs, public service, university and police! The program in Liège touched on a variety of topics linked with the prevention of extremism, intercultural work and youth violence. We organized meetings with professionals who work for the prevention of violence in the social and intercultural framework. The meeting with the police force was about public order and intelligence. The visit to NGOs focused on democracy and diversity. We also organized some cultural activities. For example, we watched a soccer game in FC Standard Stadium and planned museum or City Hall visits for participants in Liège. Did your IVLP experience help you in creating the Liège portion of the Connecting Communities program? And if so, how? I already organized international activities before because Liège is quite active in international cooperation, but, sure, the IVLP program in the USA was really useful because it was so well organized and balanced. This experience gave me a perfect example of how to do it when I organized the program here. My personal experience in IVLP helped me to identify the needs of participants because I was on the other side, also now with a little knowledge of American culture. Based on my experience with IVLP, I tried to balance the portion of visits, meetings, discussions, and learning. Besides, IVLP also taught me the importance of cultural interactions. Therefore, I provided U.S colleagues possibilities for interaction with European and Belgium culture. It is very important to build bridges between us through cultural aspects. What was your experience with Meridian like as a participant on the IVLP program? And what is your experience with Meridian like now as a programming partner for Connecting Communities? My IVLP experience was really great, and it is one of the best learning and human experiences in my professional life. The role of organizing the activity for U.S. participants in Liège was nice but quite difficult because I worked on it as an organizer, so it brings some pressure! However, it is still a wonderful experience, and I think it was rather successful. I learned a lot from organizing the program in Liège and it is very useful for me. In addition, some participants are still in contact with me. Honestly, I was impressed with both activities and by the professionalism of Meridian whose role is essential. In a couple of months, we will travel to Chattanooga, Nashville and Washington, DC with a Belgium delegation from Liège. We are looking forward to it because the professionals from both U.S. cities and from Homeland Security are involved in many interesting projects and developing high quality programs. Also, the mayor of Liège had the idea to make connections between European and U.S. cities because right now the City of Liège is president of the European Forum for Urban Security, a network founded in 1987 and including 250 cities from 16 countries about prevention and urban safety. The aim is to facilitate contact and bilateral exchanges between European and U.S. cities to become stronger facing the challenges of today. The city of Chattanooga is involved in a similar network of U.S. cities, which works in many sectors and also in prevention of violence. It would be great if we can build bridges between European cities and U.S. cities to share our best practices and to reinforce our democratic values. 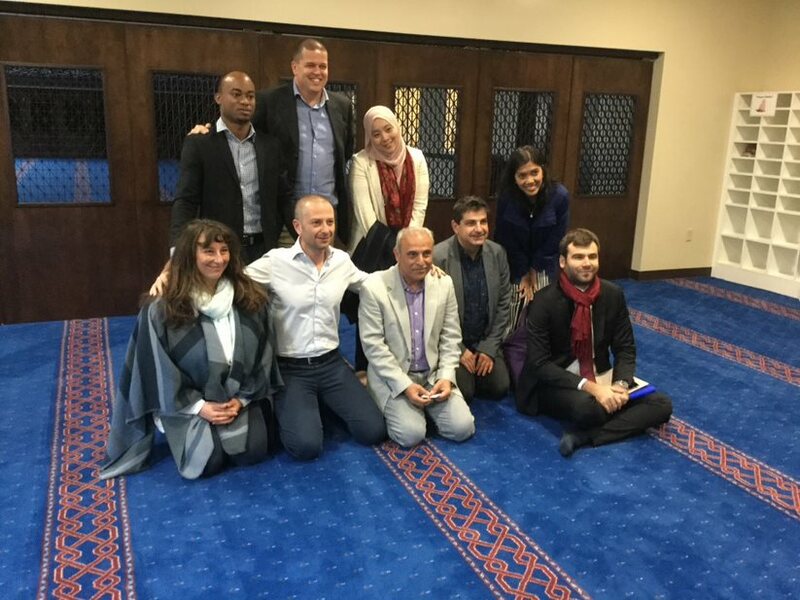 Do you believe exchanges like IVLP and Connecting Communities have a strong impact? And if so, how? Yes, it has a strong impact. Participants learned useful knowledge about the topics and had a great cultural experience. At the same time, I found IVLP and the Connecting Communities program bring motivation to us. The impact is doubled because of the interactions between participants and program partners. For example, in Liège, as partners we also learned a lot through questions and input from U.S. participants who share their experience and knowledge with the colleagues from Belgium. The role of the Embassy in Belgium is important, essential on the preparation of the activities and their follow-up. Thank you so much because the hosting of the IVLP program was definitely professional and particularly kind. You did a great work on places I visited, and I met so many lovely people. Also, I am waiting for you in Belgium and looking forward to meet you again in the U.S.! POST TAGS: Community Engagement, Exchange, Global Leadership, International Exchange, IVLP, Meridian Alumni, Meridian Impact, U.S. Department of State.